It is presumed that the industrial development in Bihar is hampered by lack of investments. Is it because of 'unproductive' government policies or an unpredictable law and order situation? And how to increase the flow of investment in the state? In order to find out answers to all such questions and debate these issues, Business Standard Hindi recently organised a roundtable in Patna. The seminar was attended by various small and medium entrepreneurs from the state. Chief Minister Nitish Kumar, while participating in the seminar, reiterated his earlier demand that the state should be accorded the special category status. He said this would provide a much-needed boost to the industrial development of the state. The chief minister also stated that most of the power plants and mines had landed up in Jharkhand after the bifurcation of Bihar in November 2000. Whereas Bihar still struggles every year with natural calamities such as floods and drought. Nitish Kumar stressed that awarding the special category status to Bihar would result in benefits such as reduced excise and income-tax and this should attract industrial houses to set up their ventures in the state. Special category states shell out only 10 per cent of the total funding for central-sponsored projects, whereas the remaining 90 per cent is made available through central government grants. An increase in the number of projects and industrial ventures will provide better employment opportunities and increase per capita income of the state. The chief minister clarified that the procedural issues were not a deterrent as the state already had a single-window approval system managed by the State Investment Promotion Board (SIPB). Image: Children at a flood relief camp in Araria district town in Bihar. While stating that governance in the state had improved, the chief minister also stressed that the law and order situation was not a major area of concern as perceived by certain industrial segments. He also claimed that the law and order situation in Bihar was much better than some other states. Some of the participants in the roundtable were also of the view that the law and order situation in the state had improved in the last few years. Yet the industrial development in the state has not picked up. The chief minister blamed the Centre for the sluggish pace of industrial development. He cites an example that if a thermal power plant is to be set up in the state, it requires coal linkage but the Centre is not very forthcoming in providing the linkage, which discourages investors in the sector. The state is already struggling with severe power shortage, with production less than half of the demand. Even after getting an in-principle approval for setting up various power plants, nothing concrete has happened due to the coal linkage issue. The chief minister showed dissatisfaction in the issues related to sugarcane industry. He mentioned that Centre's ethanol policy was not clear. Before independence Bihar had 20 per cent share in the total production of sugarcane which now has reduced to less than 3 per cent. Although Bihar has all the favourable conditions for sugar cane production, due to lack of concrete policy sugar cane in no longer considered a profitable crop. Some of the entrepreneurs attending the seminar pointed out that banks in the state were not very forthcoming in providing loans. Banks had to disburse Rs 21,000 crore (Rs 210 billion) in a financial year, whereas only Rs 8,000 crore (Rs 80 billion) were actually disbursed. The state government has instructed the banks to increase the credit-deposit ratio to 40 per cent. The seminar was organised at the Maurya hotel under the series 'Samriddhi'. It was also attended by Deputy Chief Minister Sushil Kumar Modi. Shaibal Gupta of the Asian Development Research Institute (ADRI), Suresh Gurumani of SKS Microfinance and Satyajit Singh of the Confederation of Indian Industry's Bihar unit were part of the discussion panel. 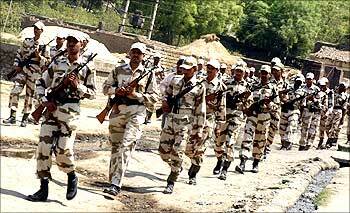 Image: Indo-Tibetan Border Police personnel patrol a road in Jehanabad, Bihar. Though CM has shown confidence, Bihar is still not getting private sector investment. In November 2005, Nitish Kumar became the chief minister of Bihar. But for him, 2006 started on a dismal note. On December 31, 2005, one of the star winners of the Janata Dal-United (JD-U)-Bharatiya Janata Party (BJP) alliance in the Assembly elections, Navin Chandra Sinha, died of heart attack. Sinha had won from Patna and had the highest winning margin among all the MLAs in the Assembly. As a sitting MLA, he was entitled to a state funeral. Kumar ordered that all the arrangements be made, including a five-gun salute. Picture the scene. Sinha's relatives were sobbing. His supporters stood grimly as the body lay in state, awaiting the salute. Five guns were required to fire in the air. The first round went off perfectly. But in the second round, three rifles jammed and merely responded with an empty 'click' when fired. Policemen scurried to get rifles that would work. In the third and fourth rounds, only two rifles fired. In the fifth round, all the rifles jammed, so bystanders 'saw' rather than heard the rifles firing. "I felt so terrible. Many in the crowd of mourners were laughing at the incident," said Kumar while recounting the event. For Nitish Kumar, that was a function of total absence of governance in Bihar. The chief minister's secretariat worked with the help of a few aged Remington typewriters. There was no facility for conference call. It needed a meeting of the Cabinet to get departments spend Rs 25 lakh. There was a reason why not to do something. Doing things or showing initiative was strongly discouraged. Ever since he has taken charge of the state, Kumar has changed some of this mindset. The biggest problem was law and order. Bihar's 'best known' business was the kidnapping industry. Gangs got political protection and operated with impunity. Safety was a bigger priority than development - what was the use of development if physically, people did not feel secure? Kumar took two steps - he used the Arms Act, under which the testimony of an SHO is enough to put an individual carrying an unlicenced weapon behind bars, to lock up strongmen, as they are known in Bihar; and second, he made sure the rate of conviction went up. In other words, he made it known that there were no holy cows in Bihar any more. A team of 11,000 retired army personnel was raised which later supplemented the state government's law enforcement efforts. One does not hear big-scale crime any more. Besides, the migration of the labour class as well as qualified professionals like doctors and engineers has been halted. 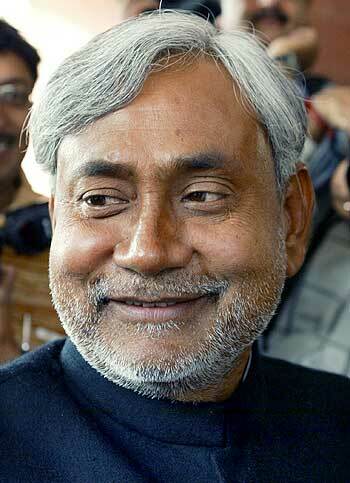 Image: Nitish Kumar, Chief Minister, Bihar. Four years ago, there were just two flights a day between Patna and Delhi. Today, there are as many as seven flights between these two cities. There are five daily flights between Kolkata and Patna now, against a mere two earlier. In addition, Bihar has an international airport in Gaya because of its proximity to Bodhgaya, a major centre for Buddhist pilgrims. Four years ago, there were practically no international flights - the odd chartered flight would come once a week. Today, 25 flights touch down at this airport every week from places like Bangkok, Colombo and Yangon. Improved law and order situation is also resulting in development. The government is spending on roads and infrastructure as well, and has kept aside Rs 5,000 crore for roads development for just one year. Bihar has become one of the largest consumers of cement. Its year-on-year growth in cement consumption is 27 per cent, compared to the national average growth of 9 per cent. However, what Bihar lacks is private sector investment. This is leading Kumar to demand that the state be given special status for tax sops that will help attract the attention of industry to invest here. But the Centre has not given its approval yet. Gradually, this seems to be one of the core issues in the forthcoming Assembly elections, to be held in the last quarter of 2010. On the negative side, the chief minister has a lot of political problems. During the Lok Sabha elections last year, Kumar campaigned using the helicopters lent to him by ally BJP because his own party showed neither the initiative nor the foresight to book planes in advance. Finally, it was a question of either taking the BJP's help or not campaigning at all. However, it was Kumar's personal appeal that the party managed to win 20 seats in the Lok Sabha elections. His relationship with the BJP tends to be rocky and this is something that suits him just fine. Kumar's plank continues to be winning the support of the most backward. This includes the most backward Muslims. Although there have been cases where the Muslims too have voted for the BJP to ensure Kumar's victory, he has to maintain a visible distance, not just from the BJP but its policies and programmes as well. Though the Assembly elections are quite far, odds are in the favour of Nitish Kumar. The question is what he will do in his second innings. If he returns to power, there is another step that Kumar has to take: getting the border problems relating to natural resources like water resolved by ensuring that the Centre acts on the issue. Barely had the state recovered from the floods of 2008, it was struck by a similar calamity in 2009. Much of the problem is the lack of water management in Nepal. This is something that can be resolved only through diplomatic persuasion. True, the JD-U's performance in the September by-elections in Bihar was less than edifying - it got just three seats against the Lalu Prasad-led Rashtriya Janata Dal (RJD), which got eight seats out of the 18 that went to the polls. But this might not be a trend. For the sake of Bihar, everyone should hope it isn't. 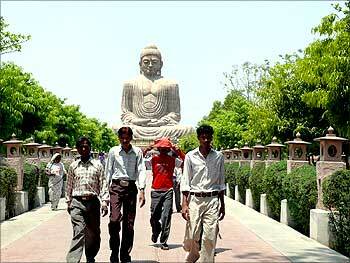 Image: Bodhgaya, a tourist destination. 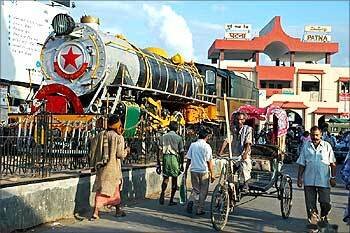 Photographs: Courtesy, Bihar Tourism website. Bihar is rich in human resources. It turns out unskilled and semi-skilled workers with the same rapidity as IIT engineers and civil servants. Long is the list of top engineers, doctors, civil servants and technocrats from the state. Business schools, medical and engineering colleges always have a more than proportionate participation from Bihar. Yet, the state is not even a blip on the radar screen of the corporate sector. Human resource-intensive sectors like information technology and information technology-enabled services have shunned the state. In fact, Bihar does not feature in the game plan of most corporations. Apart from Hindustan Unilever, no other blue-chip company has of late put money in the state. Trucks come laden with stuff from neighbours like West Bengal, Uttar Pradesh and even Madhya Pradesh but go back empty. 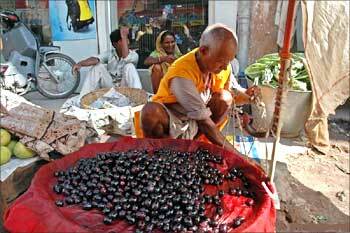 Essential commodities are all imported from other states and, therefore, sell at a premium. Cement, for instance, in Bihar is at least 5 per cent costlier than in the neighbouring West Bengal. In the past, industry's bugbear was the poor law and order situation in the state. There was nobody to guarantee the safety of executives posted there. The Nitish Kumar administration has made Bihar a better place. "If you go to any park at Patna in the morning, you will find big cars of every description," according to Chief Minister Nitish Kumar. The point is important. Earlier, such was the terror of kidnappers and extortionists that people had clamped down on any expenditure that could give away their wealth. Not any longer. When Kumar took over the affairs of the state four years ago, there was hope that the state's defunct sugar industry would revive. Bihar contributed a fourth of the sugar produced in the country before Independence. It now accounts for less than 3 per cent. Unfortunately, companies that were brought in by Kumar to invest in the sector have developed cold feet. One has even forfeited the earnest money of Rs 5 crore. There just isn't enough sugarcane to feed the mills, investors say. Set up the mills and the sugarcane will follow you, Kumar counters. It's a chicken-and-egg situation. Of course, state-owned Hindustan Petroleum Corp is putting up an ethanol unit in Bihar but experts doubt its commercial viability, given the current high price of sugarcane. And with one year to go for elections to the state Assembly, nobody will be in a hurry to put his money in Bihar. Such is the nature of politics in the state. Not everybody is sure that there is widespread political buy-in on economic reforms. Caste-based politics still holds strong in the state. What if Kumar does not come back to power? Will his successor have the same enthusiasm for maintenance of law and order or development of infrastructure? These are questions that bother corporations. Kumar puts the blame at the doorsteps of the Centre. Bihar, he says, has not been compensated for the loss of natural resources and industry to Jharkhand, coal linkages for proposed thermal power stations in the state have not been cleared, and there is no clarity on ethanol. The solution, he says, is to grant the status of "special category state" to Bihar. Image: Bihar is rich in human resources. The bottom line for Bihar is that it will have to depend on its own entrepreneurs for investments - once locals build a strong foundation, outsiders are bound to follow. Industry estimates suggest that local entrepreneurs have invested close to Rs 1,500 crore (Rs 15 billion) in the recent past. Though not large by any yardstick, it does show that there is latent entrepreneurship in the state. But they don't know what to do. When Kumar came to power, he brought several top industry leaders to the state. Road shows were held across the country. The idea was noble. One or two big names could have got others also to invest in the state. But that didn't happen. Instead, it scared local businessmen. Will we be able to stand competition from large players, most of them thought. Most local businessmen complain that the bureaucracy takes a lot of time to put into action announcements made by Kumar and his colleagues in the ministry. Orders have taken up to two years to get notified. The biggest problem they face is finance. The state is hugely under-banked. And since banks, state-owned as well as private, now follow what the market dictates, there is little the state can do. Businessmen are at times asked to fork out twice or even thrice the loan amount as collateral security. This perhaps is the reason why microfinance outfits like SKS Microfinance have done so well in Bihar. Their customers are large in numbers and non-performing assets are low. Clearly, banks can take a lesson or two from them. Although there is an overwhelming demand for a 'special category' status for Bihar, the main challenge before the state government is to build a functioning state structure, says Shaibal Gupta, economist and member secretary of the Asian Development Research Institute, Patna. 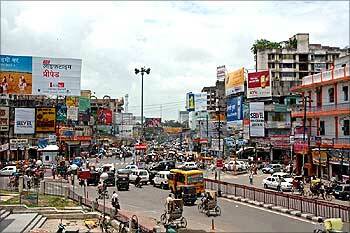 Chief Minister Nitish Kumar has been demanding a special category status for his state. Why should the state be given this status? Is it a fit case? 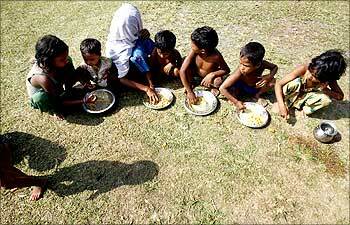 Bihar is one of the poorest states of the country. It was disadvantaged even when 'state-centric' strategy was at the height of the economy. The disadvantage was not removed through the instruments of the central government investments. With the formalisation of the 'market-centric' strategy, the possibility of private sector investment in the state is not possible without tax incentives. It is only possible if the state is placed in the 'special category status'. The status is granted to states based on two sets of indicators. On one hand, according to the Ministry of Commerce and Industry, the four parameters identified are geographical isolation, inaccessible terrain, poor resource base and remoteness to larger market, and poor infrastructure. On the other, according to the Planning Commission, the indicators are hilly and difficult terrain, low population density, strategic location along the borders with neighbouring countries, economic and infrastructural backwardness, and non-viable nature of state finance. On all counts, except in the second parameter of the Planning Commission relating to low population density Bihar deserves to be granted the special category status. Other states may also raise similar demand. In that case, what is your opinion? It is possible that other states may raise the issue but one should not forget that Bihar subsidised the entire post-Independence industrialisation of the country, by allowing its mineral resources to be taken outside through the 'freight equalisation' policy. It not only failed to trigger industrialisation within the state but it also subsidised the transportation to other states. According to one estimate, Bihar was subjected to a loss of Rs 1,12,812 crore in the steel sector on account of 'freight equalisation' in the post-1947 period. The chief minister alleges that the central government is discriminating against the state government. If so, how? The central government has been discriminating against us historically. The freight equalisation policy adopted in 1948 practically robbed us. Bihar always received the lowest per capita Plan and non-Plan grants. Ironically, when Montek Singh Ahluwalia, the deputy chairman of the Planning Commission, was visiting Bihar, the Union Cabinet had given a bonanza of Rs 8,000 crore to the Bundelkhand region of Uttar Pradesh. The central government even failed to reimburse the expenditure incurred on flood and drought, with which the state is regularly afflicted. According to media reports, nationalised commercial banks operating in Bihar have a gigantic task of meeting the target of loan disbursement as part of the annual credit plan during 2009-10 since only 37 per cent of the target has been achieved till the end of September. Will they be able to achieve the target? The Annual Credit Plan is a modest target in Bihar unlike in other states of the country. Even the modest target is not achieved. This indicates the callous attitude of bank officials in matter of loan disbursement. I don't think it will be possible to achieve the target. The total deposit made within the state in various nationalised banks was said to be around Rs 93,000 crore till September-end, while only Rs 30,000 crore had been credited to the people concerned. Where did the banks invest the remaining amount? The credit deposit ratio in Bihar is very low - at 32 per cent. Through the instrument of the banks, there is a flight of capital from the state. Instead of investment in the state, our surplus is being used elsewhere. 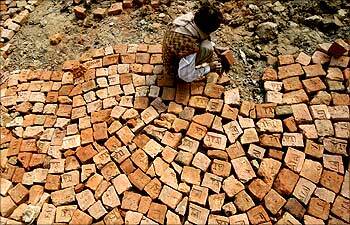 Image: A labourer works at a road construction site in Bihar. It is almost impossible to get loans from the bank, specially related to commercial and industrial ventures. There is an unspoken embargo in this matter. In contrast, if somebody wants to avail consumer loan, there is no problem. In a state like Bihar, commercial banks act as a financial lubricant to trigger economic activity. In the matter of cane and ethanol, Bihar has a natural advantage. Yet the central government policies act a fetter to develop this sector. The central government has put unilateral ban in the exclusive production of ethanol. It has to be linked with sugarcane production. On the other hand, faulty policy of procuring sugarcane acts as a hindrance to the industry. The sugarcane industry was protected to give fillip to this sector. However, the import of sugar acted as a great deterrent to this sector. The main challenge before the state government is to build a functioning state structure, where inclusion is in-built. This is not possible without banishing last vestiges of feudalism. This would entail intervening massively in the land management exercise, which would accordingly demand for updating of land records, consolidation of holding and also distribution of surplus land, if any. Without land management, in a substantive manner, there will not be any drop in the criminal and civil cases, which bring severe strain on the state system. No state in the country has developed without land management effort. The atmosphere in the realm of education needs to be improved substantially. There is a need to give emphasis on the forward and backward linkages of education. Since the induction of the present government, a number of educational institutions have been established in the faculty of law, management, medical and engineering. There was a massive recruitment of school teachers. However, the quality needs to be taken care of. The educational infrastructure needs to be improved substantially, along with quality education. Only then the migration of students can be reduced. The proper educational endowment will ensure a 'knowledge revolution' in Bihar. India 2020: What will we be like?